1. 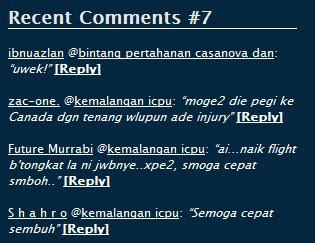 Previously, I have posted on Recent Comments Widget to keep readers and authors notified with the recent comments. I have manipulated the codes to create more styles for the widget so that it becomes more attractive and have more variety. 3. If you would like to request for any new style, you can let me know. hmm..aku try yang 1st punye style. mcm xde beza jek..
@everjihad yg 1st tu normal style la.